As you may or may not know, even through I write a blog called “Whitney in Chicago”, I am really a Texan through and through (except for my politics). One of the biggest adjustments to Chicago actually wasn’t the long, harsh winter, but the lack of true “Tex-Mex.” Sure you can get plenty of decent mexican and salsa all across Chicago, but really good Tex-Mex can only be found at the source, Texas. I’m not the only one who feels this way. Anyways, anytime that I do go back to Texas for any length of time, I always pack light so that I can bring back lots of Texas things (if only I could figure out how to get some Blue Bell Homestyle Vanilla back), most importantly…SALSA. My favorite brand to bring back is called Clint’s which is just perfect with tortilla chips. 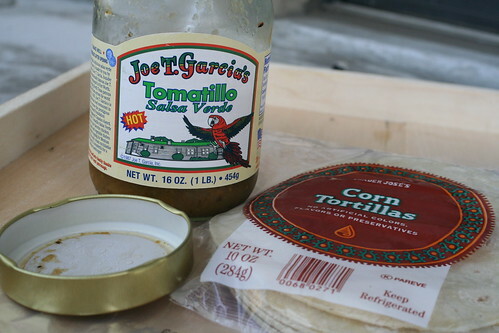 However, the last time that I hit up the HEB to stock up, I noticed that they were also carrying Joe T’s Tomatillo Salsa. Joe T’s is a Fort Worth institution that is known for its STRONG ritas, great fajitas, enchiladas and the little known fact that they actually have a menu at lunch. When I first opened up the jar, I knew that it would be better utilized in a batch of chicken enchiladas, rather than eaten up with chips. 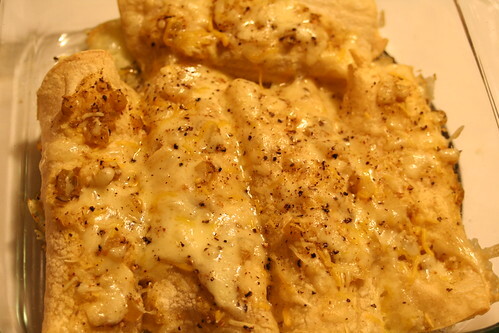 One night when I had some leftover chicken from this recipe (if you haven’t made it yet, you are really missing out on something amazing) and a pack of corn tortillas from TJs, I decided to whip up some enchiladas. Now that I have been cooking with incredibly frequency, I have more confidence in just playing around with dinner and ending up with something good. This was one of those nights. This recipe is very adaptable, and if you aren’t lucky enough to live in Texas (or have friends/family who visit from Texas and bring you salsa) I am sure you can substitute some other green style hot salsa or even make up your own. Preheat oven to 350 and find a square baking dish. Filling: Saute the diced onions in a good glug of olive oil or in bacon grease in a pan over medium heat. Once soft and beginning to brown, add shredded chicken and cumin. Add a few tablespoons of the salsa and stir to coat the chicken. Set aside. Tortillas: In a large pan, heat up some vegetable oil, about a tablespoon and brush the pan to coat all sides over medium heat. Fry the corn tortillas about 30 seconds to a minute on each side to get rid of the raw taste. Set on a plate. Assembly: Spread a tablespoon or two of salsa on the bottom of a glass baking dish (or anything you normally bake in). Grab a tortilla in the palm of your hand and fill with the chicken mixture and some shredded cheese. 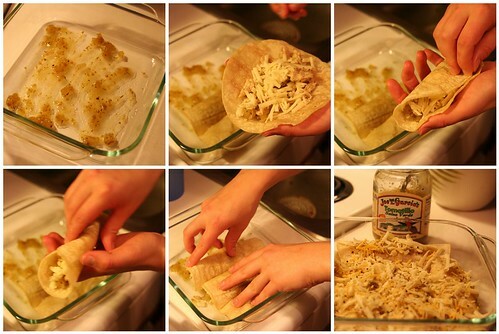 Roll up the tortilla into enchiladas and place in the pan, seam side down. Don’t make them too full so that they can’t fully close. Continue until you run our of tortillas or chicken mixture. Top each enchilada with more salsa and cheese. Crack some black pepper on top for good measure. Bake in an oven at 350 for 10-15 mins or enter the cheese is melted. Enjoy with a little sour cream or plain. This entry was posted in Chicken, Dinner, Mexican, Recipe and tagged Chicken, Dinner, Enchiladas, Main Dish, Mexican, Recipe, Salsa, Texas. Bookmark the permalink. 1) Those look FANTASTIC and I will be making enchiladas this week now! 2) Was at Green City today and looked for you. Realized that I really had no recollection what you looked like! 3) There is EXCELLENT Tex-Mex in Chicagoland, but you’re probably right, its not as good as Texas! Great job! What a great way to use up leftover chicken too! I make a mean salsa – if you have time, click on my link and go to the page “my garden overflows” – I char the tomatoes on the grill and it gives the salsa this amazing smokey flavor. I live 55 miles NW of Chicago – so I am officially living in the “sticks” but I used to live in Oak Park. Wow these look really tasty… and i love the step by step. I’m a Texan too and these look like true tex mex! Can’t wait to try! Oh, Whitney! The things that we could list that Texas does best! While I am thrilled to be living in California, happily partaking of the abundant fresh produce and uncanny ability of native soil to nurture just about any vegetable or fruit you can imagine, I never stop missing Texas. I wish that there was a way for me to load up on good, fresh, HOT salsas, brisket, and various condiments made with green chile every time I visited home. Your enchiladas look soooo good, I almost left for the grocery store to pick up every item I didn’t have. Mara-Where is your favorite Chi-Town Mexican? I’m always up for suggestions. I miss Tex-Mex, too. My dad goes crazy without it, so he’s managed to find all of the good Mexican restaurants within a 30-mile radius of his house. But nothing compares to the original. The last time I asked for chile con queso, I got a can of cheese whiz that had been microwaved and dumped into a bowl.